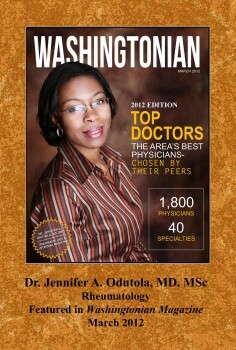 Jennifer Odutola, M.D., MSc, CCD is the Medical Director of Loudoun Rheumatology Center. Dr. Odutola was born in Kingston, Canada. She attended medical school at the College of Medicine of the University of Lagos and then went on to St. John's Institute of Dermatology at the University of London, United Kingdom where she obtained a Masters of Science in Clinical Dermatology. She has a broad-based experience having worked as a physician in three continents. She completed her residency training in Internal Medicine at the Albert Einstein Medical Center, Philadelphia PA and then proceeded to the National Institutes of Health, Bethesda, MD for her Rheumatology Fellowship training. She also worked as a Senior Medical Officer at the Dewsbury District Hospital, Dewsbury, United Kingdom. Dr. Odutola is board certified in Internal Medicine and Rheumatology. She has also been certified in Clinical Densitometry by the International Society of Clinical Densitometry (ISCD). She is an active member of numerous professional organizations and societies including the American College of Rheumatology, American Medical Association, American College of Physicians, National Medical Association and Arthritis Foundation. Her clinical and research interests include the medical treatment of Rheumatoid Arthritis, Fibromyalgia, Osteoporosis and Systemic Lupus Erythematosus. She also has a strong interest in Osteoporosis screening and patient education in Osteoporosis. Dr. Odutola is published in peer- reviewed journals. JAMDA 2001 Vol.2(2): A15 . How appropriate is '9 or more medications' as a quality indicator? Goldberg T, Bhat R, John J, Yazdani K.
Dr. Saleem completed her medical degree from King Edward Medical College, Pakistan. She then went on to post graduate training at University of Connecticut, she finished her residency at UMDNJ in New Brunswick, NJ and her Rheumatology fellowship at UVM in Burlington, VT. Prior to joining our Practice 3 years ago, she has worked as a Rheumatologist in Winchester, VA, Purcellville, VA and Annapolis, MD. In every area she works she brings a passion and zeal for the practice of Rheumatology. Her special interests include Rheumatoid Arthritis, Lupus and Osteoporosis. Dr Saleem is board certified in Internal medicine and Rheumatology. On a personal note she enjoys reading and outdoor activities with her family. She is fluent in Hindi, Urdu and French. She will be seeing patients at the Purcellville and Lansdowne locations. Dr. D’Souza graduated at the top of her medical school in India and went on to complete an Internal Medicine Residency at the Medstar Good Samaritan Hospital in Baltimore, MD. She began her Rheumatology career at the University of Virginia where she completed her fellowship in Rheumatology and then joined the faculty as an Academic Rheumatologist. Her special interests include rheumatoid arthritis, osteoporosis, gout, osteoarthritis and lupus. She is Board certified in Internal Medicine and Rheumatology. Dr. D’Souza, her husband and daughter reside in Loudoun County. When she is not working Dr. D’Souza enjoys walking, bird watching and cooking. Dr. D'Souza is bilingual, she speaks fluent English and Hindi. She will be seeing patients at the Lansdowne, Purcellville and Dulles locations. For more information or to schedule an appointment, please call 703.723.3378.